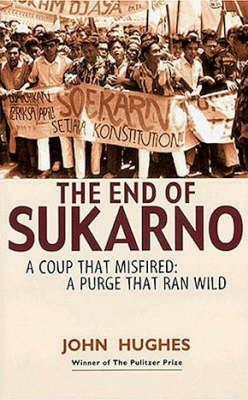 With leading characters including Subandrio, Sugandhi, Sugijono, Suharto, Sujono, Sukarno, Sukatno, Sukendro, Sumpeno, Supardjo, Suparno, Suprapto, Surabaya and Sutjipto, End of Sukarno: A Coup That Misfired: A Purge That Ran Wild, by John Hughes, is not a book you can speed read without completely losing the plot. Sukarno was the President of Indonesia from 1945 to 1967. There was a failed coup in 1965, which this book describes. In the following two years there then followed the slaughter of hundreds of thousands of Communists within Indonesia, and following this, Sukarno’s eventual eclipse. Sukarno was also known as Bung Karno, Soekarno, Pak Karno, and variations of Achmad Sukarno. A confusing man in a confusing place. If you read the book carefully, however, it is not confusing. I did not know about the semi-organised killing of hundreds of thousands of communists in Indonesia during those years. The other book I’ve beeen reading is Their Heads are Green, by Paul Bowles, which is mainly about Bowles’ travels in Morocco in the 1950s, amongst the Berber and Imochagh people. 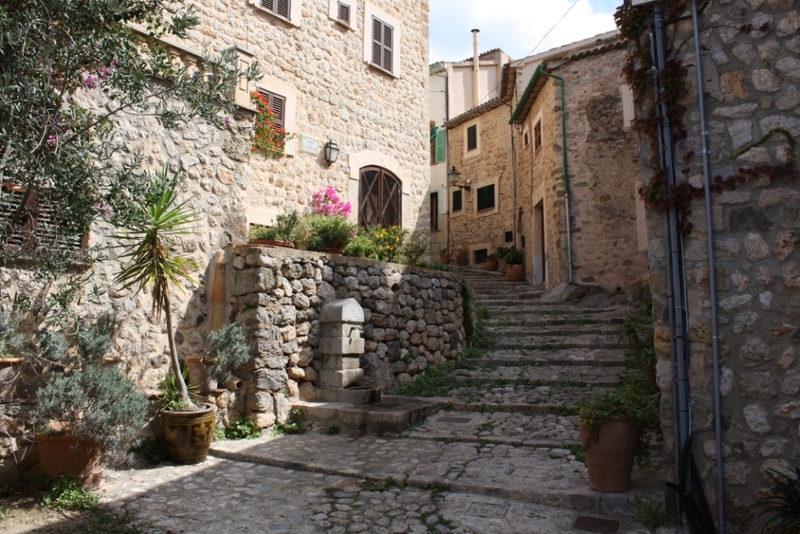 He recorded local folk music during his trips. This vimeo may give you a flavour. We know the Imochagh as Touareg, but Bowles points out that the word is a term of opprobrium meaning ‘lost souls’. Imochagh means the free ones. In the past few days I’ve written seven blog posts reviewing what I found when I visited each of the Scottish university library websites in turn, looking for information or advice on keeping currrent. Overall, standards have been IMHO very poor, with numerous broken links found in the short time I spent looking at these websites, faults with search engines, and very little quality advice about keeping up-to-date. I now want to rank the websites, giving points for various things. 1 point if the various search services worked without problems. 1 point if the various search services were clearly labelled so that you know what you’re searching. 1 point if I didn’t find any 404s or broken links. 1 point if the site mentioned Zetoc. 1 point if the site mentioned JournalTOCs. 1 point if I found any reasonably good advice on keeping current. 1 point if there was a current awareness service (that was not full of errors). Looking through that list of eight pretty basic things, one would surely hope that a university library would at least score 7. Abertay University Library: 1 point (consistency (albeit consistently no mentions of keeping current, etc)). University of St Andrews Library: 1 point (labelled search engines). 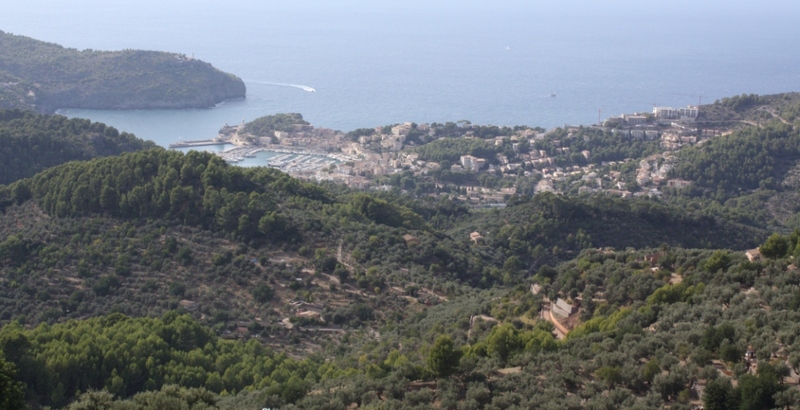 University of the Highlands and Islands: 1 point (mention of Zetoc). University of Dundee Library & Learning Centre: 2 points (no 404s found, mention of Zetoc). Queen Margaret University Library Services: 2 points (mention of Zetoc, mention of JournalTOCs). University of the West of Scotland Library: 2 points (searches work OK, mention of Zetoc). University of Aberdeen Library: 3 points (searches work OK, no 404s found, mention of Zetoc). University of Glasgow Library: 3 points (labelled search engines, no 404s found, mention of Zetoc). University of Edinburgh Library & Museum services: 4 points (searches work OK, labelled search engines, no 404s found, mention of Zetoc). University of Strathclyde Library: 4 points (no 404s found, mention of Zetoc, mention of JournalTOCs, advice on keeping current). Edinburgh Napier University Library: 4 points (labelled search engines, mention of Zetoc, mention of JournalTOCs, advice on keeping current). Glasgow Caledonian University: 5 points (labelled search engines, no 404s found, mention of Zetoc, mention of JournalTOCs, advice on keeping current). 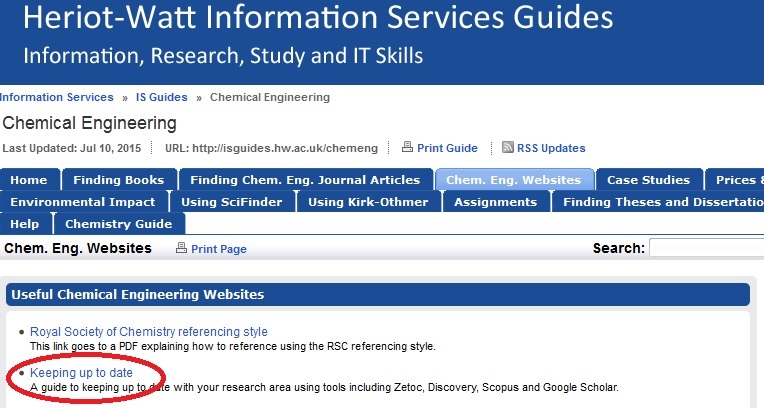 Heriot-Watt University Information Services: 6 points (searches work OK, labelled search engines, no 404s found, mention of Zetoc, mention of JournalTOCs, advice on keeping current). University of Stirling Information Services: 6 points (searches work OK, labelled search engines, no 404s found, mention of Zetoc, mention of JournalTOCs, advice on keeping current). At least they all avoided ‘nil points’. Heriot-Watt and Stirling came out best. Both Heriot-Watt and Stirling didn’t score points for consistency or having an actual current awareness service, so no library reached my reasonable expectation of 7 points. If I’ve made any errors in the above or in any of the reviews, please let me know. I hope there will be fewer problems with the other Glasgow based universities. Do people really also search for , , ? I don’t think so. Anyway, of the three results, two don’t mention journaltocs, so I don’t know why they appeared in the results. 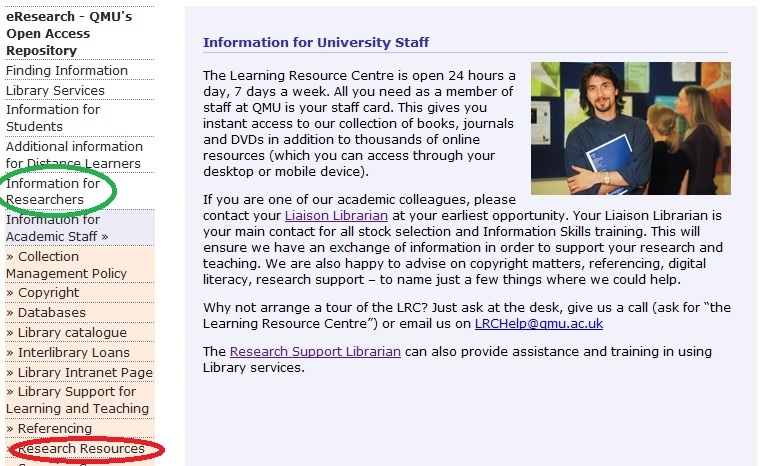 The other one, however, is a good: Where do I start – Keeping up-to-date with research leaflet, which does include information about JournalTOCs, and there are links to this leaflet from Library Support for Researchers, and some of the LibGuides (e.g. Library resources for Computer and Information Sciences), but not others. No consistency, then. If you search the University of Glasgow website for ‘zetoc’ you get three results. None of these three are to this page, which is the University of Glasgow Library record for Zetoc and should surely be part of the website search. I found that page by following the link from Information types–which one and how to evaluate, which I found from the main university website search. There are zero results when you search for ‘journaltocs’. There’s a Keeping up to date guide, and despite it’s opening statement that, “It is important that you stay up to date with new developments in your subject” the guide is so basic, and has no links, that it is not very helpful. 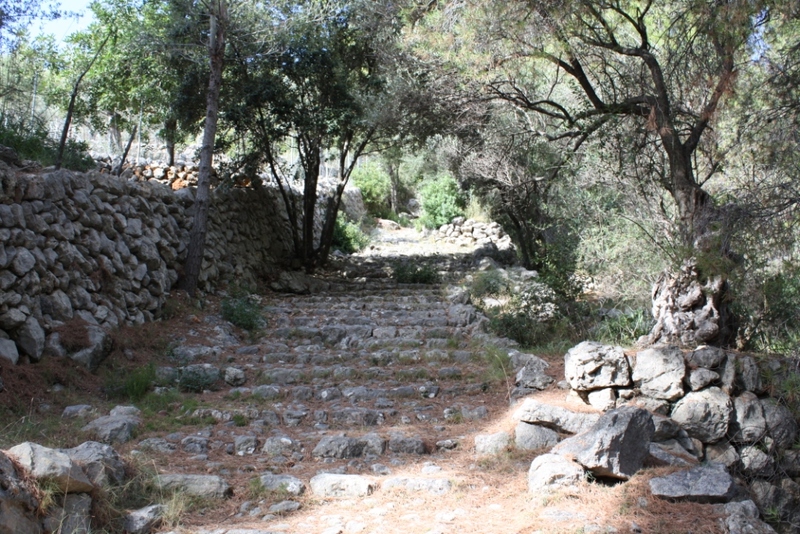 Some of the Subject Guides link to Zetoc, but many don’t. That’s about it, although there may be information in their moodles, to which I don’t have access, and which may not be indexed by the site search. Search the Glasgow Caledonian University website for ‘journaltocs’ and you get two results. Both results are to exactly the same page, and if you keep going, you get to this page about alerting services. Zetoc, but not JournalTOCs, is mentioned on a Searching for RSS feeds, which is part of a PILOT (Post doc Information Literacy Online Tutorial). I also found this out of date page by searching the GCU site for ‘Zetoc’ and once again getting duplicate results. JournalTOCs is included in the Database A-Z, as is Zetoc. The various subject guides have lists of all relevant databases, e.g. 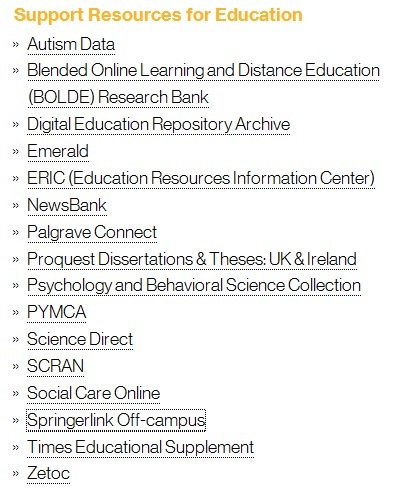 All Databases for Psychology and All Databases for Health but many of these don’t include Zetoc. After a fair bit of rummaging around the Robert Gordon University website, I found a mention of JournalTOCs and Zetoc on the library’s Training (CM) (RefWorks and Literature Searching – PH4014) page. Zetoc is included in the A-Z of databases, but JournalTOCs is not. Zetoc, which includes 52 million article citations and conference papers, isn’t included in many of the lists of databases by subject. They did have Researcher workshop on keeping current in March, and again in July of this year. That’s about all I could find. With respect to the University of the Highlands and Islands, which is the last of the universities in my reviews, what is the name of their library search service? Is it Multi-search, or Multisearch? And is Multi-search / Multisearch different to MultiSearch (with a capital ‘S’) or MultiSearch Plus? Strewth! Four names for what I think is the same thing (their Summon database from Serials Solutions). Actually, maybe not. I get 613 results! This is intriguing, because when I search again, I get 611 results. What IS going on? Anyway, I know fine well that this is searching for articles, rather than what I’m actually looking for – I simply thought I’d give it a go to see what happened. I wish I hadn’t bothered with Multi-search / Multisearch / MultiSearch / MultiSearch Plus. Zetoc is listed in their A-Z. JournalTOCs isn”t. I can’t see any advice on keeping current, apart from a brief mention about Zetoc Alert in the A-Z, the link to which is, unfortunately, 404 Not Found. I’ve been shocked by how many errors I’ve been finding during these reviews of Scottish university library websites. Doesn’t anyone check that basic hyperlinks from the main library pages work? The worst one, so far, has been the LibrarySearch at Napier. The ‘Find subject guides’ link still doesn’t work today, and I’ve just noticed that the ‘Library on student portal’ link fails today as well. I know it’s only a missing ‘s’, but why does this happen? Maybe I should be applauding the fact that there’s both a link to the library, and another one to library e-Resource(s). 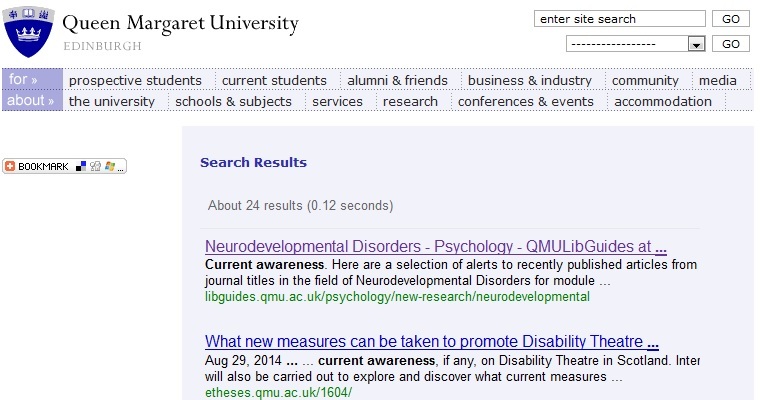 We’ve seen with other university library websites that there’s sometimes advice on current awareness in subject guides. The UWS guides were particularly clearly written, but had nothing about keeping currrent. 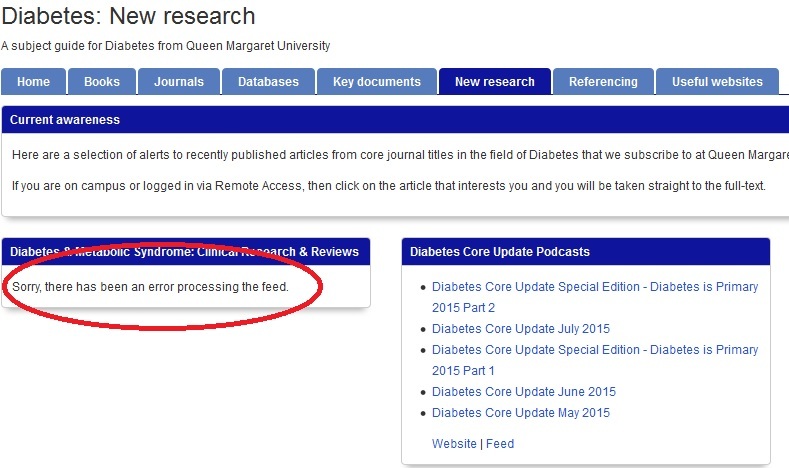 I then checked the Information for researchers guide, but again found nothing. The A-Z list of databases includes Zetoc, but not JournalTOCs. The website is quite wordy, databases and services appear in various lists, but often there’s no indication about what these databases contain. 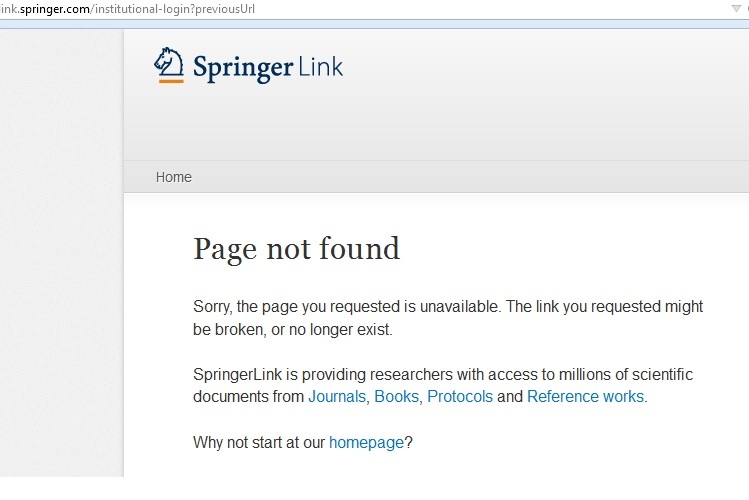 I can’t help but wonder whether, for example, ‘Springerlink Off-campus‘ without an explanation of content, will mean much to the average researcher, but it doesn’t really matter anyway, because the link didn’t work when I tried it. So, nothing that I can find at the UWS Library website about keeping current, and one or two problems with the website. 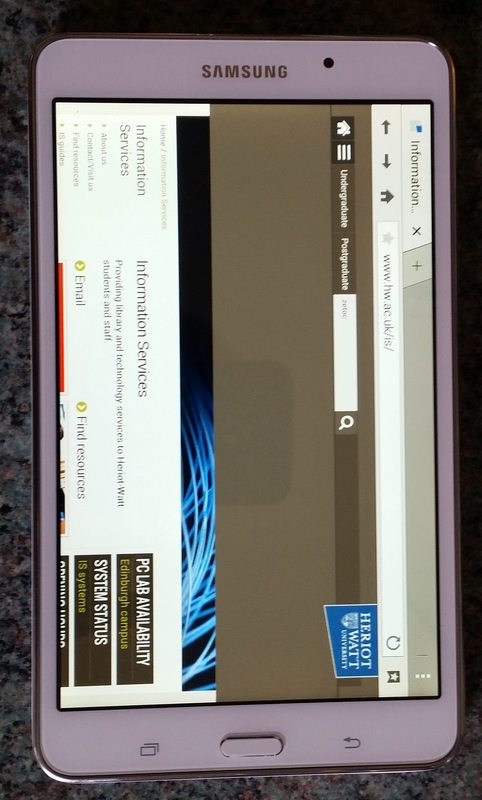 It was a bit of a relief for me to be able to write, in Part 4 of these reviews, that Heriot-Watt University Library had some good, up-to-date information about keeping current on their website. What about the Library & Museum services at the University of Edinburgh? Its a massive site, full of useful information. I can’t see anything relevant to current awareness on their A-Z list of IS services, and I can’t see any way to search only the library pages. There’s a lot of Subject guides, some of which mention Zetoc. Zetoc is included in the Databases A-Z list, but JournalTOCs isn’t. I can’t see any advice about keeping current, though. 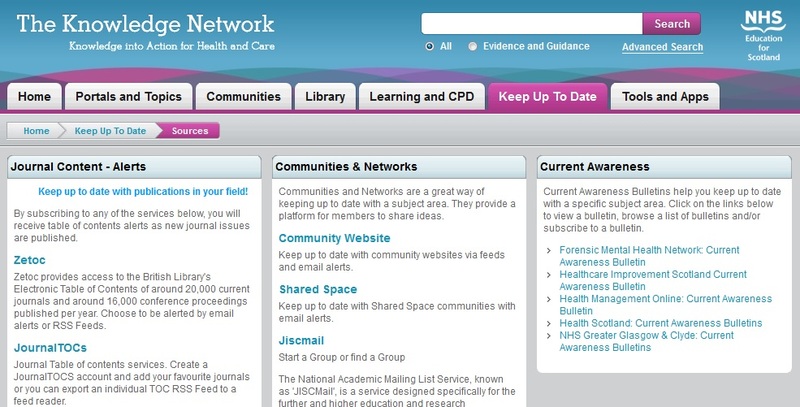 In the Resources for Medicine guide there’s a link to the Knowledge Network, which is an external website. The Knowledge Network is not part of the University of Edinburgh Library & Museum services, but it does have a Keep Up To Date section, which in turn has a News section and a Sources section. 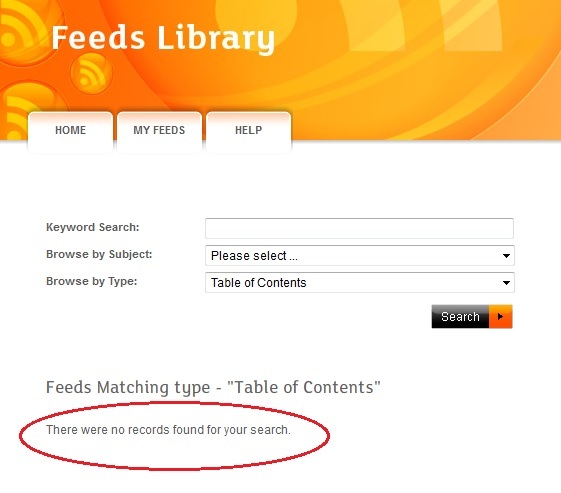 The Feeds Library looks interesting, and is some sort of current awareness service, but having spent some time looking at it, it is not obvious to me how it works. So, as far as I can see, Edinburgh University Library doesn’t have any advice on keeping current. On one subject guide there’s a link to the Knowledge Network, which leads to some relevant information, and that’s about it. But its a large website. I’ve only looked in the obvious places. 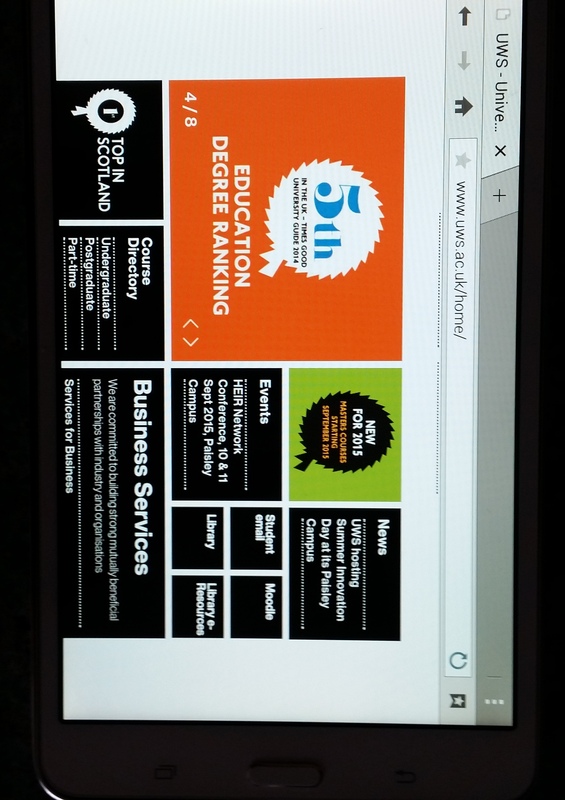 What about Edinburgh Napier University Library? Crikey, I can’t see any relevant or likely links from their home page – there’s only links to Accessibility, cafés, Christmas opening, etc. What’s going on? You must be joking! Unlike a lot of folk, I didn’t give up. I tried following the advice on the “Oops!…” page and did a search for ‘subject guides‘ but that didn’t work. Somehow, and I can’t remember how, I got into some staff webpages, and found the list of Subject Guides. And from this list I found: Arts & Creative Industries Subject Guide: Current Awareness and Contents Pages which has some useful information. Just don’t ask me how to get there from the Napier home page. I can’t even see a link to the library from that starting point. And also, when I searched the unlabelled search box at the top of the Subject Guides A-Z page, I found this Keeping up to date page. When I started out to review Scottish university library websites giving information about current awareness I thought it would be a fairly simple process. I didn’t expect to find so many problems with the various websites. I’ve been using these sites in a normal way, and certainly haven’t been looking for problems. As far as I’ve found so far, only the University of Stirling Information Services has given any real advice on keeping current, and only QMU Library Services has provided any sort of alerting service, albeit one full of errors. What about the other university libraries in Edinburgh? 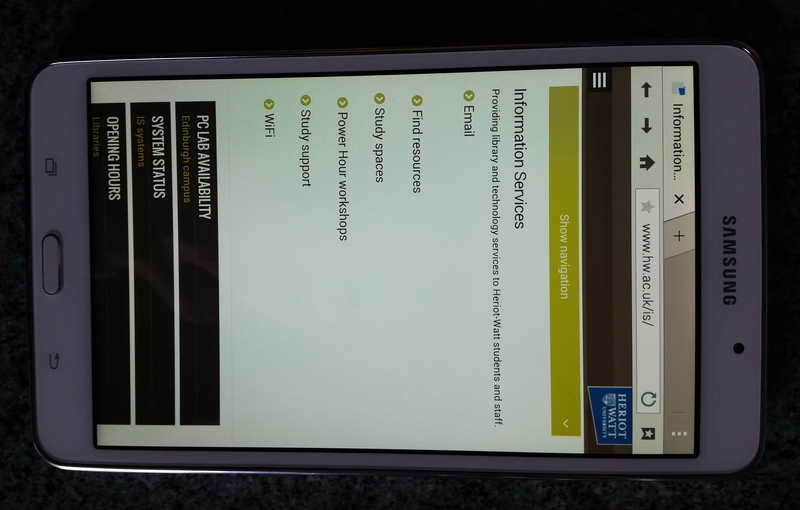 Heriot-Watt University Information Services – I used to work at Heriot-Watt, and I don’t want this review to sound anything like “Eee lad…it were mooch better in my day” or alternately, “Eee lass…you ‘ave it so good, nowadays”. I will try to be completely objective. I know that, for a long time when I worked there, we had a terrible website, and then we developed a better one, but that one contained so much information that it was very difficult to keep it up-to-date. Since then, they’ve produced another version, and as far as information on current awareness is concerned, on first glance it looks good. But before looking at the current awareness links, I have to say – what is that enormous swishy light thingy graphic that takes up so much vital real estate near the top of the IS home page? I don’t see it when I access the site on my phone or tablet. Ahem – unless I look at it in landscape, anyway. But then it is mostly hidden by a completely useless beige rectangle. But that’s beside the point. So, what information and advice do H-W IS give on keeping current? When I search for ‘Zetoc’ from the IS home page, the first result is a link to a Keeping up to date handout. This is dated February 2015 and is very good and very helpful. It mentions both Zetoc and JournalTOCs, and other sources for keeping up to date. The links work – well done! Also, I note that Zetoc (though unfortunately not also JournalTOCs) is mentioned in the Database A-Z list. I don’t understand why there are two different, with differing designs, Subject Guides lists – there’s this one, and also this one, but when you click through to the same guides linked to on each list you sometimes, but not always, get advice on keeping current (a link to the good Keeping up to date handout mentioned above). So, you get advice on keeping up to date if you’re looking for Chemical Engineering information, or Electrical & Electronic Engineering, or Mechanical Engineering, or Petroleum Engineering, or Renewable Energy, but not Computer Science and some other subjects. Don’t computer scientists need to keep up-to-date? I’m fairly impressed with much of the content of the H-W IS webpages. 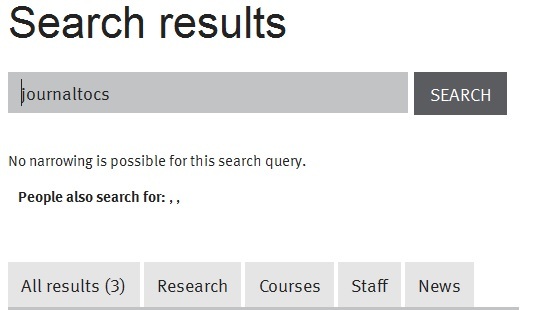 Unlike some other university library websites I’ve been looking at, their LibGuide pages even indicate what it is that you’re searching when you use the Search box. 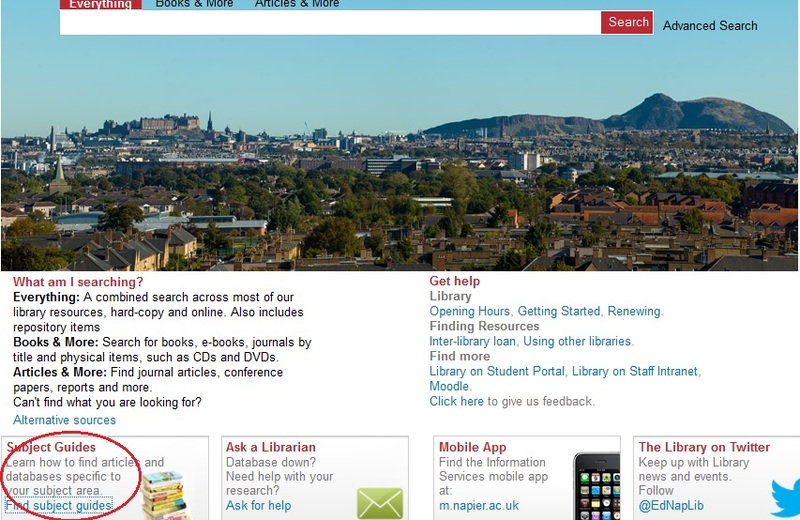 In my next post I’ll look at the remaining two university library websites in Edinburgh. So far, my review of Scottish university library websites giving information about current awareness has yielded disappointing results. Not so much as a sniff of an actual service for current awareness; some websites that don’t even mention major services such as Zetoc or JournalTOCs, some pretty dreadful website designs with features that don’t work, inconsistencies, and often only the barest of information or advice for researchers and students. So far, only the University of Stirling Information Services has a good website with information on keeping current. Elsewhere, there is very little assistance offered. I searched the site for ‘Journaltocs’ and there were two results – good! The first link takes you to Research Resources, which lists various useful websites and services, including JournalTOCs – good! But the list does not include Zetoc – Bad! 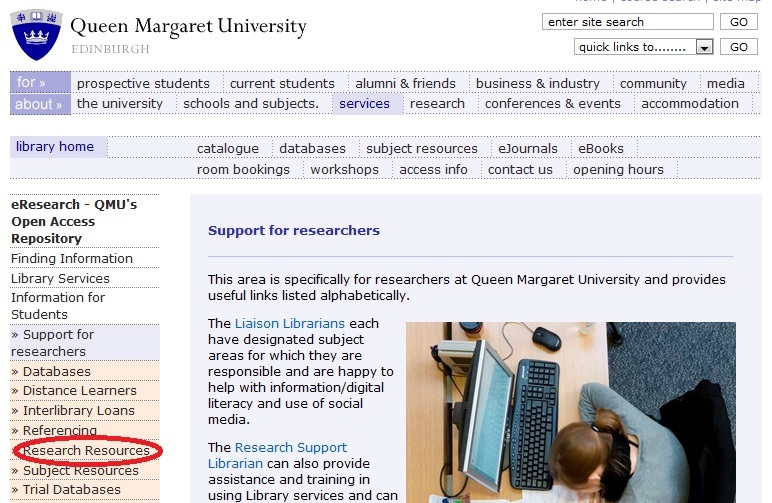 The link to Research Resources (circled in red, below) is on a page of Information for University Staff. I noticed that on that same page, over to the left, there’s a link to ‘Information for Researchers’ (circled in green, above), so I clicked on that link. There, on the Information for Researchers page (actually it now titles itself ‘Support for researchers’) is also a link to Research Resources. But when I click on this link it takes me to a Research Support: Home set of pages, using a different template, which are quite different to the list of Research Resources. I couldn’t find any specific advice on current awareness, so I went back to the Library Services home page, and searched for ‘current awareness’. Eh? This is not, I think, a fault with the QMU Library Services pages, but rather a problem with the QMU website as a whole. But it’s not good, is it? Hmm! The website is in a mess, is my conclusion. Unfortunately, as you can see above, some of these don’t work properly. In fact, in some cases, most of them don’t work. 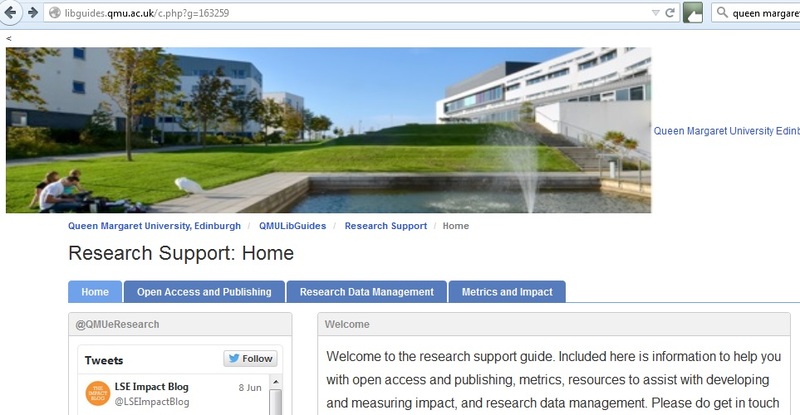 Finally, Zetoc is not listed included in the guide listing databases and other resources for use by staff and students at QMU. I find all of these errors, inconsistencies and omissions in a univerdsity library website quite unsettling.